A lot of you will be playing Yakuza 0 over the next few weeks, and for many it will be your first time with the series. Which is OK! While it may seem daunting at first, we’re here to help. You no longer have an excuse not to play a Yakuza game. Below are some handy, general and very much beginner’s tips to help you on your way with the game. 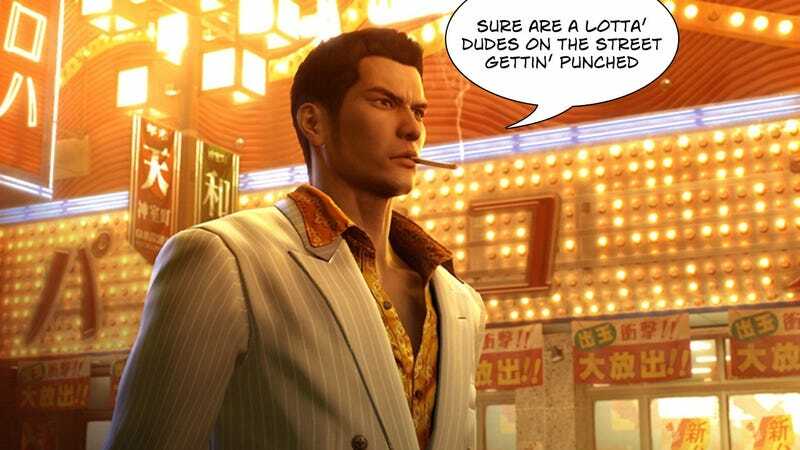 Not only will they help with Yakuza 0, but if you then decide to push on and explore Kiryu’s adventures in other times, you’ll find they’re pretty relevant for other games in the series as well. Series veterans...these will be a lot less useful to you. You’ve been warned. There’s a massive gulf in Yakuza 0 between the real heart of the game and the mechanic that will most test you. Not many people buy this game for the fighting, they buy it for the world and story, but it’s fighting you’re going to need to do if you want to get anywhere. Because of that, if you’re ever running intro trouble...just slide the difficulty down to easy. It’s not a total cop-out—you’ll find that encounters with large groups of enemies are still challenging—but it makes things simple enough that you won’t hit many roadblocks on your way to the next dramatic cutscene. Let’s say you ignore that advice, or you’re someone who’s actually decent at brawlers. In that case, you’re going to be exploring the fringes of each combat style’s upgrade wheel, and finding that many of the best attacks are locked out, even if you’re flush with cash. That’s because you need to unlock these through training and sidequests, so if you’re finding your progress through main story missions halted by a tough boss or encounter, track back and spend some time improving your own skills. Yakuza 0's more difficult fight sequences are exhausting affairs, and you’ll rarely get time to catch your breath (or heal up). So before you go on a story mission, make sure you’re fully equipped with as many healing drinks as you can carry. Specifically, stock up on Staminan Royale, which you can get from the drug store in each city. Yakuza 0 has a very old-fashioned save system, only allowing you to store your progress at phone booths scattered around the cities and between chapters. So every time you complete a story mission, save. And every time you’re about to begin a story mission, save. To compensate for the reduced character roster in Yakuza 0, both Kiryu and Majima have a number of different styles of fighting they can employ. Which sounds good in theory, but you’ll really only need two of them: Kiryu’s default (the other two styles are too limited in their application), and Majima’s “slugger” (which is almost a God Mode, especially with its “bat nunchuk” heat move). BONUS FIGHTING TIPS: You’re mostly impervious from getting knocked down if you’re grabbing an opponent. So if a swarm of bad guys is making life tough for you, that’s always an easy way out (throwing is a decent boost to your heat moves too, which can really help clear a room). Also, the best basic upgrade you can get for Kiryu is a move where he can leap off the ground after getting knocked over and perform a brutal finishing move, which in most cases is an insta-kill. The game worlds of Yakuza 0 don’t really change. You don’t unlock massive new areas of the map, or see the availability of places drastically changed. Which means you should never feel like you’re being rushed through the story. If you want to stop and smell the roses (and play 60 sidequests) at any point, then do it. Random encounters can be fun and rewarding, but they can also get tiring if you’re running around the map on other business. You’ll eventually pick up the ability to literally throw cash at this problem, but until then, know that you can always see gangs of thugs on the map before they engage you. If you don’t want to fight, just give them a wide berth and, if they chase you, just keep on running. They’ll give up eventually. While games like GTA will slowly introduce you to each of its leisure pursuits over the course of the main story, a lot of the best parts of Yakuza will sit undiscovered unless you venture out and find them. So do just that. Like I said above, the story can wait at any point, so whenever you feel like having some fun, head out the door and visit a club or sports facility for some of 0's more off-kilter pursuits. Or, if you really want to explore, just run around the streets; some of the best diversions will only be found by noticing that an “enter” prompt appears on the screen when you run past its door. The main story only ever puts you near a cab when you need to leave the two main hub worlds for a side adventure. So it’s never explained to the player that there are actually taxis parked all around the edge of both Tokyo and Osaka’s maps, available at all times, which serve as fast-travel points. You can see them on the game’s map screen as little car icons. Sometimes, I get it, you’ll want to run around and enjoy the city, but if all you need to do is get to a drug store or a certain sidequest location, then catching a cab is the fastest way to get around. That should just about do it! Like I said above, these are tips for people who have never played these games and are trying Yakuza 0 on the insistence of people like me. They’re not for series veterans. That said, if anyone with experience with the series have any other good ground-level tips, let me know below and if they’re good I’ll add them!